See this link for a list of tasks required for this aug. The only real difficulty in the quest came from the mojax and fenia bloods, mostly due to me trying to duo the whole thing. 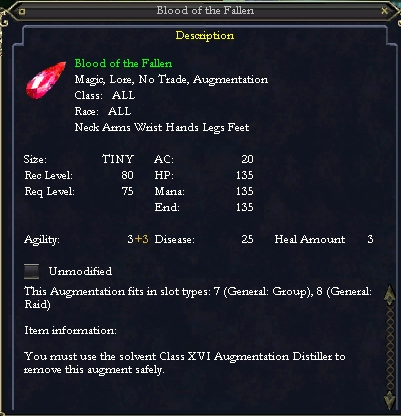 For that particular part you need a good bit of DPS (enough to clear about 25 mobs before any repop). Rest of it is easy, just takes time to find everything and everyone. Some of the quests require taking on 3-4 mobs at once, but for the most part they're kitable. You will need to go and speak with Scout Talendien to get the faction modifier Army of Light Pendant and Scout Zialdiruun to get the faction modifier Army of Obliteration. Also you need apprehensive faction with Silla Herald in order to buy the Bloodbind Cauldron that you will need to combine your bloods in. There are 7 bloods you need to combine to make this. These tasks are all given by the Army of Light (west side of zone). So please remember to Equip your faction modifier. All the bloods for this are orange. There are 7 bloods you need to combine to make this. These tasks are all given by the Obliteration Army (east side of zone). So please remember to Equip your faction modifier. All of these bloods are blue. There are 8 bloods you need to combine to make this. These are in the zones of Kithicor and Commanlands. I believe IF you have to have a faction modifier on to talk to these people it would be the Army of Light Pendent. All of these bloods are red.